FAA recently announced that it is considering adopting a policy to address the impact of one engine inoperative (OEI) procedures as part of its Part 77 obstruction evaluation process. A complete copy of the FAA’s Notice and proposed policy may be found here. FAA has requested comments on the proposed policy by July 28, 2014. The reason for the proposed policy is the agency’s recognition that development is increasingly encroaching into areas near airports that were once largely undeveloped. The presence of these new and proposed structures – in particular, high-rise commercial buildings, wind turbines, and other tall structures – is making it more difficult to ensure sufficient space for emergency OEI procedures for certain aircraft. Faced with these new obstacles, airlines may be forced to accept significant weight penalties for certain operations, which in turn could make it technically or financially infeasible to provide air service to a specific market. The results could be serious for airport operators, both in terms of impaired airport capacity, or, in the worst case, elimination of some service altogether. Encourage airport operators facing encroaching development to voluntarily institute a process, in cooperation with the FAA, aircraft operators, and communities, to define an OEI operating area for each runway used for commercial operations. If the process is instituted, require airport operators to incorporate any resulting "OEI operating areas" into the Airport Layout Plan in the same manner that Part 77 surfaces are depicted on the ALP. The revised ALP would be subject to FAA review and approval (including NEPA review as appropriate). Once an OEI surface is incorporated into an ALP, FAA would review potential impacts to that surface during any Part 77 obstruction review process. Specifically, FAA would find a proposed structure to be a hazard if it: (1) exceeds an existing (non-OEI) obstruction standard and (2) penetrates the new OEI surface. Conversely, the FAA would not consider a proposed structure to be a hazard if it penetrated the new OEI surface but did not exceed an obstruction. Because of existing constraints, encroaching development, or other unique facts at specific airports, this new policy may provide an important tool for certain airports to meet their grant assurance obligations to ensure compatible land use. In its current form, however, the policy fails to address a number of potentially critical issues. For example, the proposed policy does not have a mechanism to require stakeholders to participate in the process if an airport operator elects to define an OEI operating area. 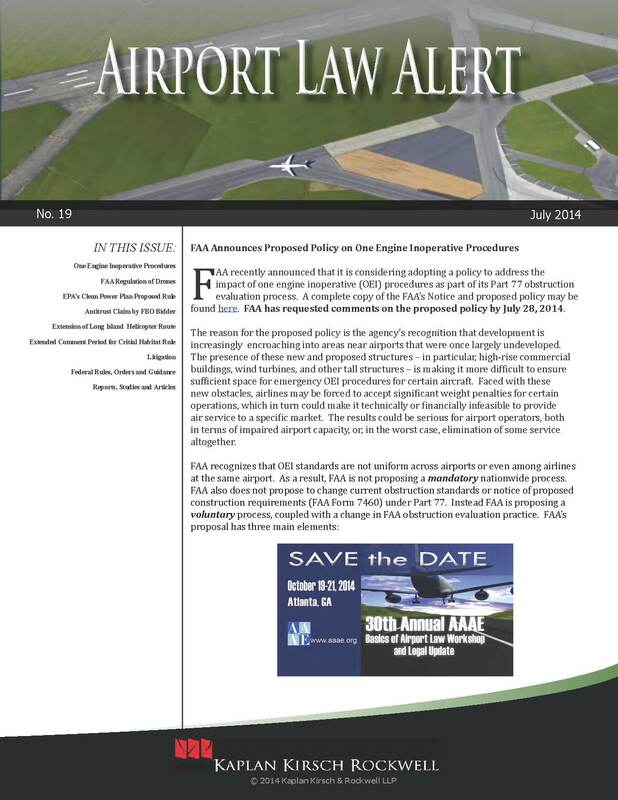 Nor does the proposed policy address the airport operator’s authority to resolve differences among stakeholders, or the standard the FAA will use in reviewing any proposed OEI operating area. Because of the potential value of this proposed policy, though, airports may want to consider submitting comments to help the FAA make the policy as effective as possible. The popular press seems to report almost daily on the demand for commercial use of drones and the FAA’s failure thus far to publish a regulatory framework that would provide for such use. FAA’s progress towards integration of unmanned aerial systems (UAS) into the national air space—and the implications for airports—will be the subject of a session at this year’s AAAE Airport Law Conference, to be held Oct. 19-21 in Atlanta, Ga. In the absence of regulation, there is a de facto ban on commercial use of drones; public entities may seek authorization on a case-by-case basis to operate UAS for non-commercial purposes, and many have done so. FAA has attempted to enforce the ban on commercial use under its general aviation regulations. However, FAA’s authority to do so is under scrutiny. Specifically, on March 6, 2014, a National Transportation Safety Board (NTSB) administrative law judge granted a motion to dismiss an FAA order assessing a fine on an individual for allegedly operating a commercial drone in an unsafe manner. If upheld, the ruling will spotlight the need for FAA to engage in a formal rulemaking specifically regulating the use of small drones for commercial purposes. The NTSB administrative law judge found that there is currently no enforceable FAA rule under which FAA could take regulatory action against the commercial operator of a small UAS for unsafe operation. Huerta v. Pirker, Decisional Order, NTSB Docket CP-217 (Mar. 6, 2014). The sole FAA publication that addresses civil use of unmanned aircraft is a 1981 policy statement, AC 91-57, that provides voluntary safety guidelines for model aircraft operators operating for non-commercial purposes. In 2007, FAA issued a guidance document, Notice 07-01, stating that AC 91-57 could not be relied upon as a basis for commercial operation of UAS, and announcing that all civil UAS operators are subject to the same FAA regulations as any other aircraft: unmanned aircraft for civil use "must obtain an FAA airworthiness certificate the same as any other type of aircraft." 72 Fed. Reg. 6689-90 (Feb. 13, 2007). The guidance announced that commercial UAS operations would be authorized only on a case-by-case basis, and like all other commercial flights, would require a certified aircraft, a licensed pilot, and operating approval. The judge, however, held that Notice 07-01 is not binding on civil UAS operators because it has not been subjected to a notice-and-comment rulemaking process. The decision is stayed pending the FAA’s appeal to the full NTSB. The appeal has been fully briefed. 1 Although FAA will miss the deadline regarding larger drones, it has made progress on small UAS (under 55 pounds and flown below 400 ft.) and expects to publish a draft rule for commercial and civil use of small UAS this fall. See http://www.faa.gov/news/updates/?newsId=76240. On June 2, 2014, the Environmental Protection Agency ("EPA") announced its Clean Power Plan Proposed Rule to regulate greenhouse gas emissions for existing fossil fuel-fired power plants (the "Proposed Rule"). This Proposed Rule is perhaps the most significant environmental initiative undertaken by the Obama Administration and, if finalized, will have far reaching effects on the environment and the market for electricity. In brief, the Proposed Rule seeks to achieve a nationwide 30 percent reduction in carbon dioxide emissions from existing fossil fuel-fired power plants by 2030, as compared to 2005 emissions levels. Among other tools to meet these reduction requirements, the Proposed Rule encourages expanded use of renewable energy, efficient gas-fired energy, and energy efficiency. The Proposed Rule requires states to achieve interim goals by 2020, and final goals by 2030. The economics of on-airport solar and efficiency projects will likely improve through state or utility subsidies, increased renewable energy credit prices, and other mechanisms. At the same time, as electricity generated by traditional utilities becomes more expensive, electricity generated by on-airport solar, co-generation and other projects will likely become more cost competitive. The number of proposed wind and concentrated solar energy projects near airports may increase to meet increased demand for renewable energy. Many of these projects might raise FAR Part 77 and other airport land use compatibility issues. The Proposed Rule may cause electricity rates for airports and other customers to rise in the medium to long term, affecting airport operating costs. The Proposed Rule is also indicative of possible future greenhouse gas regulation of the aviation industry. Despite previous efforts, Congress has not passed comprehensive legislation regulating greenhouse gas emissions. As a result, the Obama Administration has used existing authorities under the Clean Air Act to regulate industries and sources (such as electric power and automobiles). The Administration has not sought to use such power to regulate greenhouse gas emissions from aircraft, preferring to work through ICAO. However, environmental groups are likely to continue to push for regulation of greenhouse gases from aircraft under the Clean Air Act. Any future regulation would likely primarily focus on aircraft operators, but may also impact airports. The Proposed Rule will be subject to political and legal challenges. EPA has indicated that it would publish a final rule in the summer of 2015 at the earliest. On June 9, 2014, the U.S. Court of Appeals for the Tenth Circuit affirmed the dismissal of a case brought by JetAway Aviation, a disappointed bidder for FBO services at Montrose Regional Airport, against Montrose County, Colorado. JetAway Aviation v. Bd. of County Commissioners of the County of Montrose, Colorado, Nos. 12-1173 and 12-1194 (10th Cir. 2014). JetAway alleged that the County and an incumbent FBO had violated Sections 1 and 2 of the Sherman Act by manipulating the bidding process for an FBO in order to exclude JetAway. The District Court entered summary judgment in favor of the County on the ground that JetAway lacked "antitrust standing" because JetAway had not suffered an "antitrust injury" because there had been no harm to competition. The Tenth Circuit affirmed, although the two concurring opinions (the third member of the panel passed away before deciding the case) reached that conclusion using very different analyses. Judge Holmes relied on the fact that the market for FBO services at the Airport could support only one FBO, so that allowing JetAway to compete would only replace one monopoly with another, which is not what the antitrust laws were intended to facilitate. Judge Tymkovich focused on the theory that an airport operator, as a proprietor, can decide who will provide services on its airport without implicating antitrust laws. It is important to note that District Court found that Montrose County could not invoke the defense of "state-action immunity" under Parker v. Brown, 317 U.S. 341 (1943), because, under Colorado law, Montrose County did not operate as the State of Colorado when operating the airport. The FAA announced recently that it would extend the expiration date of its New York North Shore Helicopter Route rule by two years. The rule was set to expire on August 6, 2014, and now will expire instead on August 6, 2016. The full notice is available at 79 Fed. Reg. 35,488 (June 23, 2014). FAA noted that it expects to issue a Notice of Proposed Rulemaking on the permanent use of the route in the "immediate future." During the extension, helicopter operators flying along Long Island’s north shore must continue to use FAA’s mandatory off-shore VFR route, although pilots may deviate from the required route and altitude when necessary for safety, weather conditions, or transitioning to or from a destination point. FAA’s initial promulgation of the rule, making mandatory a previously voluntary route, was upheld by the D.C. Circuit in Helicopter Association Int’l, Inc. v. Federal Aviation Administration, 722 F.3d 430 (D.C. Cir., 2013). The United States Fish and Wildlife Service and the National Marine Fisheries Service have announced that they will extend the comment period on two proposed rules (see 79 Fed. Reg. 27,060 (May 12, 2014); see also 79 Fed. Reg. 27,066 (May 12, 2014)) and on a proposed policy (see 79 Fed. Reg. 27,051 (May 12, 2014)) that address how the Services determine whether to allow exclusions from critical habitat. The current July 11th deadline is now extended until October 9, 2014. The first proposed rule redefines what constitutes destruction or adverse modification of critical habitat. The second of the proposed rules amends the regulations governing the procedures and standards for designating and revising critical habitat. Because it is not uncommon for an airport to provide some of the last remaining patches of open grassland or other kinds of habitat in rapidly developing areas, airports can be dramatically impacted by critical habitat designations. Among other things, protection of critical habitat can put airports into direct conflict with FAA regulations regarding wildlife hazards – which are meant to discourage wildlife from using habitat around airports. Airports Council International-North America (ACI-NA) has requested input from its members to assist them in drafting comments for the proposed rules. Alliance for Safe, Efficient and Competitive Truck Transp. v. FMCSA, No. 12-1305 (D.C. Jun. 17, 2014) (accepting the notion that an informal presentation, such as a PowerPoint presentation, by an administrative agency could trigger new rulemaking obligations if they announce new rules or differ materially from the formally promulgated rule). JetAway Aviation LLC v. Board of County Commissioners, Nos. 12-1173 & 12-1194 (10th Cir. Jun. 9, 2014) (affirming the district court’s grant of summary judgment in favor of Defendants on the basis that JetAway did not have antitrust standing to bring its claims). Northwest, Inc. v. Ginsburg, No. 12-462 (U.S. Apr. 2, 2014) (holding that the Airline Deregulation Act preempts a state-law claim for breach of the implied covenant of good faith and fair dealing if the claim attempts to enlarge the contractual obligation voluntarily adopted by the parties). Air Wisconsin Airlines Corp. v. Hoeper, 134 S. Ct. 852 (2014) (holding that Air Wisconsin had immunity under ATSA for true statements made to TSA regarding a pilot that the airline believed was potentially a threat). Town of Barnstable v. FAA, 740 F.3d 681 (D.C. Cir. 2014) (rejecting petitioner’s challenge to the construction of 100 wind turbines in Nantucket Sound on the grounds that FAA had failed to properly analyze the adverse effects of the wind turbine as required by regulation). City of Santa Monica v. United States, No. 13-8046 (C.D. Cal. Feb. 13, 2014) (explaining that City’s quiet title action regarding the property underlying the Santa Monica Airport was barred by the statute of limitations), appeal docketed, No. 14-55583 (Cal. Ct. App. Apr, 11, 2014). Louie v. Huerta, Nos. 13-1285 & 13-1286 (D.C. Cir. Dec. 23, 2013) (dismissing the petition after FAA agreed to prepare, at a minimum, an Environmental Assessment in regards to airport’s request for a Part 139 Certificate). DHS v. MacLean, 714 F.3d 1301 (Fed. Cir. 2013), cert. granted, 82 U.S.L.W. 3470 (U.S. May 19, 2014) (No. 13-894) (reviewing whether a federal air marshal is protected by 5 U.S.C. § 2308(b)(8)(A) after disclosing sensitive security information without authorization). National Federation of the Blind v. USDOT, (D.D.C. 14-00085) (challenging DOT’s Final Rule regarding the accessibility of airport automated kiosks). Tulsa Airports Improvement Trust v. United States (Fed. Cl. No. 13-906) (FAA has filed a motion to dismiss claiming that only the United States Courts of Appeals has jurisdiction to determine whether FAA failed to reimburse the Tulsa Airports Improvement Trust for costs incurred as part of its Noise Abatement Program). Director’s Determination, De Vries v. City of St. Clair, FAA Docket No. 16-12-07 (finding that the City of St. Clair is in compliance with its grant assurance obligations as they relate to negotiations for an aircraft hangar lease). Decisional Order, Huerta v. Pirker, NTSB Docket No. CP-217 (Mar. 6, 2014) (finding that FAA could not fine Respondent because there was no FAA rule enforceable regarding model aircraft at the time of the flight), appeal docketed NTSB Docket No. CP-217. Notice - Request for Comment, Notice of Proposed Airport Access Restriction and Opportunity for Public Comment, 79 Fed. Reg. 36,577 (Jun. 27, 2014) (announcing that FAA has determined that the application for an airport noise and access restriction submitted by the Los Angeles World Airports for Los Angeles International Airport (LAX) is complete. This is only the second instance since 1990 that FAA has found an application under FAR Part 161 to be complete). Draft AC 150/5100-14E, Architectural, Engineering, and Planning Consultant Services for Airport Grant Projects (Jun. 6, 2014). Draft AC 150/5340-26C, Maintenance of Airport Visual Aid Facilities (May 7, 2014). Draft AC 150/5345-10H, Specification for Constant Current Regulators and Regulator Monitors (May 6, 2014). Draft AC 150/5220-20A, Airport Snow and Ice Control Equipment (Apr. 28, 2014). Proposed Rule, Definition of ‘‘Waters of the United States’’ Under the Clean Water Act, 79 Fed. Reg. 22,188 (Apr. 21, 2014) (publishing for public comment a proposed rule defining the scope of waters protected under the Clean Water Act, in light of the U.S. Supreme Court cases in U.S. v. Riverside Bayview, Rapanos v. United States, and Solid Waste Agency of Northern Cook County v. U.S. Army Corps of Engineers). Notice of Extension to Order, Operating Limitations At New York LaGuardia Airport, 79 Fed. Reg. 17,222 (Mar. 27, 2014). Notice of Extension to Order, Operating Limitations At Newark Liberty International Airport, 79 Fed. Reg. 16,857 (Mar. 26, 2014). Notice of Extension to Order, Operating Limitations At John F. Kennedy International Airport, 79 Fed. Reg. 16,854 (Mar. 26, 2014). Program Guidance Letter, 14-03: Guidance on Federal Share at Airports Located in Public Land States (Mar. 11, 2014). Program Guidance Letter, 14-02: FY 2014 Essential Air Service (EAS) and Economically Distressed Areas (EDA) Determinations (Feb. 21, 2014). Federal Aviation Administration, Asset 2: In-Depth Review of the 497 Unclassified Airports (Mar. 2014). Report 108: Energy Technologies Compatibility with Airports and Airspace (Apr. 2014). Rachel Tang, Congressional Research Service, R43545 Airport Privatization: Issues and Options for Congress, (May 12, 2014). A. Kenney, RDU says Uber and Lyft drivers breaking airport taxi rules, (Jul. 14, 2014). B. Phillips, Uber and Lyft Services Not Allowed at Memphis Airport, (Jun. 27, 2014). D. Forster, Virginia DMV orders Lyft, Uber to stop operating, Virginia Pilot (Jun. 6, 2014). J. Hilkevitch, City halts ride-sharing company’s foray into Chicago airports, Chicago Tribune (May 6, 2014). B. Summers, Popular ride-sharing service UberX halts LAX pickups amid police crackdown, Los Angeles Daily News (Jan. 24, 2014). J. Hodge, General Aviation Security: Risk, Perception, and Reality, 26 Air & Space Lawyer, No. 4 (2014) (subscription required).